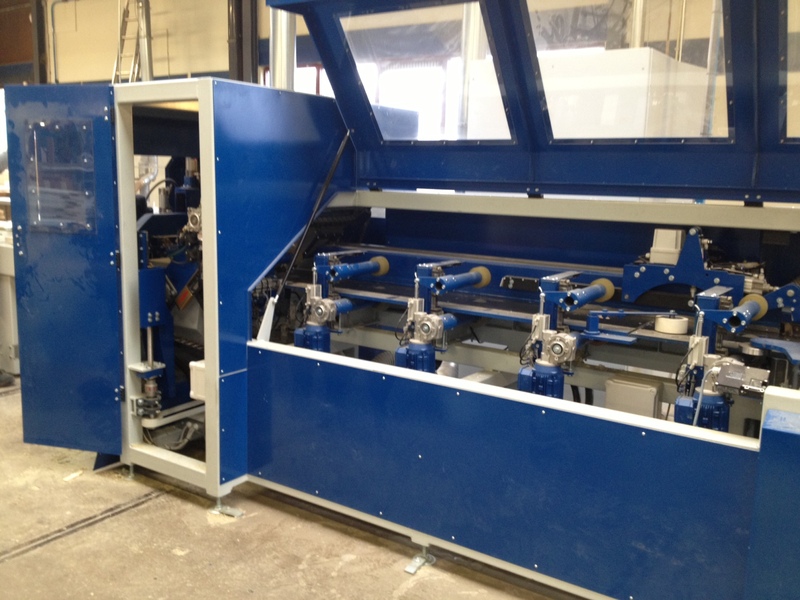 Another successful application from our Netherlands distributor Innomotion. 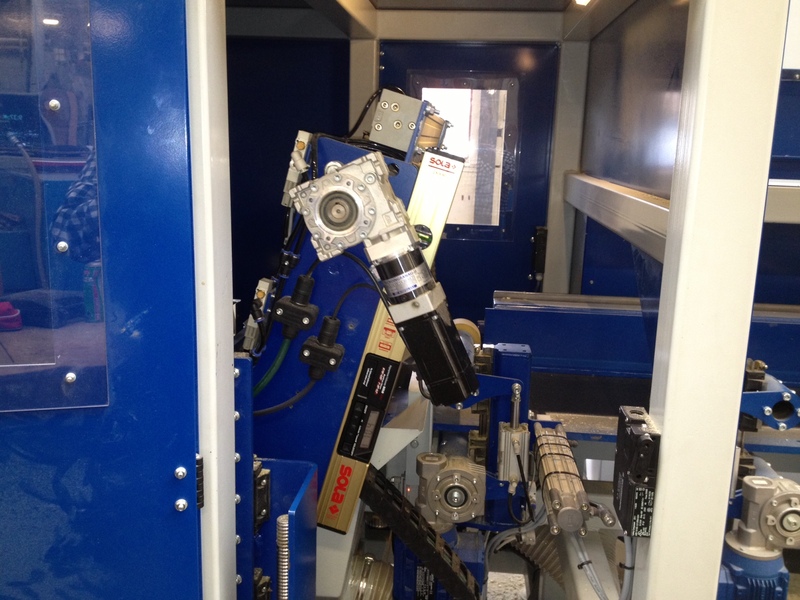 This time is a Woodcutting / Profiling machine with 11 axis control! As you can see on the picture our partners use 7 VFD-E drives for transportation and high speed spindle, and 4 servodrives ASDA-A2 400W for the cutting/profiling. Everything controlled by central CPU with Master CANopen module (DVPCOPM-SL). Via the PC Cad drawings are imported to the Machine and machine settings are executed. 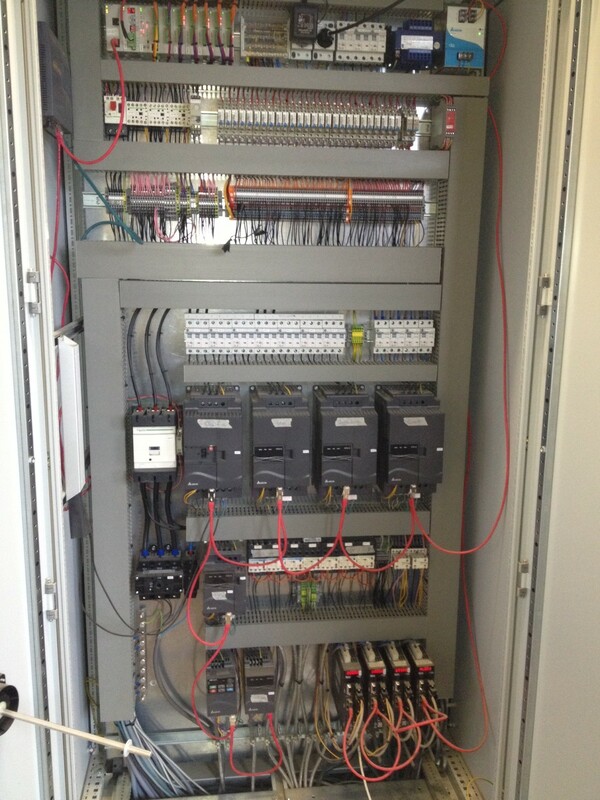 The PLC is controlling all the I/O and servo’s for the motion. In this machine the wooden boards for the stairs are cut to length , width and angle on front and end of the board. The PC software is written in Labview. And with some luck, you can use it as inspiration for your next project! But because the inverters accuracy (usually) is not very good, the engineers, prefer to use Steppers, or Servosystems. So the majority of the inverter applications used to be Speed or Torque control. But the last years, in the industry appears the need to realize good positioning with middle power and reliable cost. Servo drives are still too expensive for middle power and steppers are only for low power applications. Because of that, the new C2000 surprise us again, with the capability to have accurate positioning using Step & Direction control. The way to achieve the good accuracy, is because some feedback encoder located on the motor and the EMC-PG01L card, to acquire the feedback and position command at the same time. If you wolud like to set up this system in your factory, or for your customers, check the following tutorial presentation from Mr. Robert Lo. 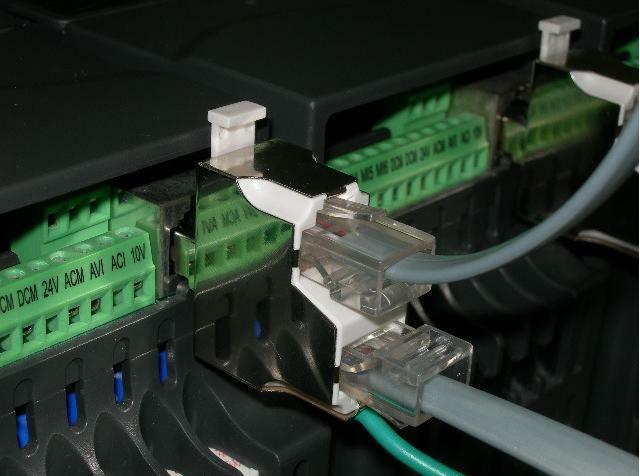 PLC-Link is not only a tool to exchange data between PLC’s. In this case I would show you the procedure to do it with VFD-E series drive. The advantage of this method agains the “sending frames one” is that you don’t need to program and trigger one frame for every value read or write to the slave. With this method, you only have to configurate the communication, and you will have any Slave value in your master buffers. 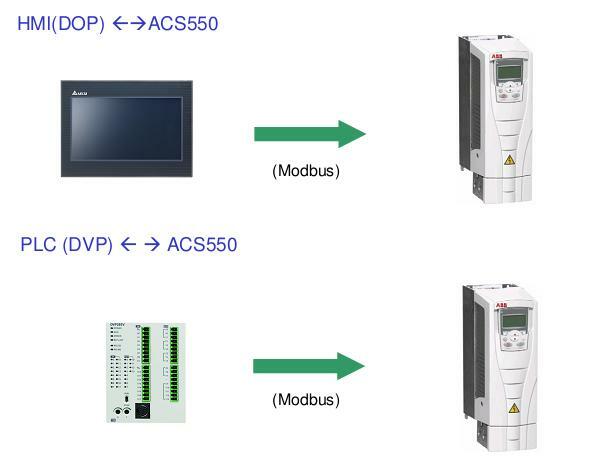 use exactly the same advices as the PLC-VFD communication post. 2. Decide the protocol to be used. The important think on this step is get ready the inverter to receive orders from RS485 interface, so depending the inverter the values are going to be different. In this example I use VFD-E. 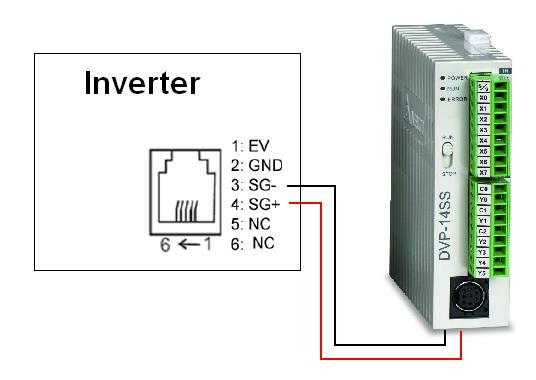 Check the parameters If you are going to use another inverter. In this case I recommend to have the manual opened, because basically is a matter to configure the PLC-Link special registers properly. To find what register I need to edit in each case, look in the manual for any of those registers, and look for the proper one. And Check the following program and test it. I’m pretty sure that system will save you a lot of time and efforts. This time I’ll give you the tools to control some Delta Inverter with Delta PLC trough RS-485. I’ll made this tutorial step by step, starting as always from the hardware. The pinout in this case is really simple, the middle pins of the RJ11 (or RJ45) are the positive and negative of the RS485 communication. So I recommend to buy some RJ01 from Delta inverter range, or some telephone wiring, cut one side and use the flying leads to connect to the PLC. And remember to write the protocol in a paper avoids future problems! 3. Configuration of the Inverter. To send some frame trough the PLC RS485 port, we’re going to use the instruction MODWR (API 101) and the special mark M1122 to trigger the communication. Inverter Data Address for VFD-E.
To read some frame trough PLC RS485 port, for example the Frequency Output. We’re going to use the instruction MODRD (API 100) and again the special mark M1122 to trigger the communication. But this time, we will use the special registers D1050 to D1055, where we could found the data received. You can download the PLC program examples on the next link.